Definitely one of the best spy thrillers ever written, the Matt Helm series is top notch - especially the first 15 or so. Death of A Citizen may be the best spy novel ever written. A non-Helm novel by Donald Hamilton that is also great is ASSASSINS HAVE STARRY EYES. Be sure to pick it up also. I envy you your first reading of Death of a Citizen! 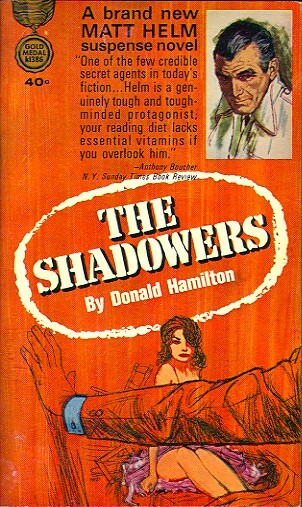 I know you're an Executioner fan and so it will interest you to know that before Don Pendleton became a writer, Donald Hamilton and Mickey Spillane were his two favorite writers in that field. He held Hamilton in the highest regard. Hamilton's first 10 novels are uniformly excellent. Steve's right. Death of a Citizen is even better than The Shadowers. And don't miss Line of Fire, which may be his best book of all. Tom, Stephen, and Bill, thanks for the comments! I'm almost ashamed that such good writing has sat on my shelves for so long, but I aim to rectify that mistake, especially with all the great suggestions. I agree wholeheartedly with Steve. The first 10 books are amazing. And the same is true of John D.
BTW, just adding "The Adventure Factory" to my blogroll. Donald Hamilton is my favorite writer. Period. Thanks for this review, I have been wondering about the series for a while now. I have #9 and 12 but have not yet checked them out. I certainly will now. Don't they have great titles?